Taxpayers helped pay for the stadium. Yet they aren't allowed to decide how and for how much to resell their tickets if they can't make the game? Fans have shelled out billions for construction, upkeep, and repairs of stadiums to keep their team happy and local. Yet when fans purchase a ticket to a game, what they do with their ticket may come with strings attached by the team. Season ticket holders who want to sell a ticket to a game have been met with price floor minimums, resale fees, and all sorts other restrictive red tape. Fans already pay the team full asking price for their tickets. The team should not be able to reach even further into the affairs of ticketholders, especially since taxpayers foot such a heavy portion of the stadium cost! 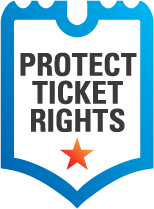 Together, fans can demand the end of unfair practices! 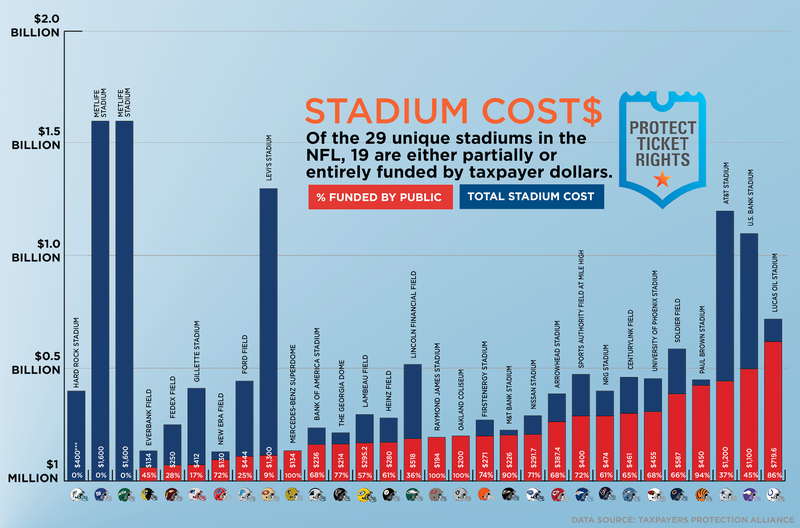 See below for a team-by-team breakdown of the over $6 BILLION spent to build these stadiums. Restricted paperless tickets. A growing number of NFL teams are deciding to use paperless tickets with added restrictions on how and where a ticket can be transferred or sold. This impedes the right of the ticket owner to employ them as desired. For example, it was reported that the Washington Redskins charged fans $50 to leave a ticket at will call, even though taxpayers contributed to nearly 30 percent of FedEx’s fields financing. Extra fees on resale. Fans are by now well-acquainted with the experience of buying a ticket on one of the NFL’s resale platforms, only to see its price substantially inflated by fees and charges. A prime example are the Pittsburgh Steelers fans who are forced to pay up to 20 percent in extra fees on the NFL’s ticket exchange, even though 61 percent of Heinz Field’s financing came from the fans directly. Similarly, although 65 percent of CenturyLink Field financing came from the public, Seattle Seahawks’ fans can also expect to pay 20 percent in extra fees on the resale exchange. Price floor minimums. Although the settlement announced in November between certain state Attorneys General and the NFL halted the “price floor” policy, which set arbitrary minimum resale prices, teams still may “unilaterally” impose their own floors. In fact, it was reported that the Tampa Bay Buccaneers (100 percent of the funding of its stadium came from taxpayers), would not allow any ticket to be resold on the NFL Ticket Exchange for less than $35.